Quite possibly the most versatile reusable container ever offered to packaging, recycling and material handling engineers, the rugged P-291 and P-333 series containers maximize shipping, handling and storage efficiencies. As the cornerstone of the Ship Shape family of MOD containers, they cube out tractor trailers stacking 2-3 high and 2 across and safely accommodate up to 600 lbs. of solid, pourable, granular, non-regulated material. For smart returns, the containers nest five- to seven-high and in storage, they nest or stack even higher. Molded nesting “lugs” or “ribs” prevent units from jamming together. All are available in a wide variety of colors, and with optional permanent, molded-in or raised graphics, logos and tracking numbers. 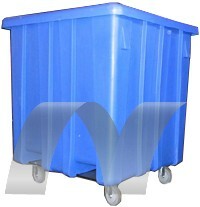 Bases for rotating-head dumpers, casters, fork pockets and custom options, are offered.